Step-by-step approach helps students produce a well-organized, clearly developed portfolio that is the foundation of academic coursework. Realistic writing models guide writers while clear explanations, supported by examples, help students through typical rough spots. Extensive practice helps students assimilate writing skills to learn to write with accuracy and confidence. 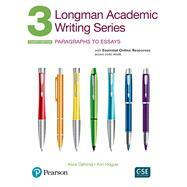 Timed writing activities provide a plan for writing paragraphs on tests. Interactive tasks, such as pair and group work, allow students to receive peer feedback on their individual writing. Level 5 offers more advanced guidance in the writing of essays and research papers. New Essential Online Resources include grammar for writing and sentence structure activities, teacher support material, teacher's manual, and assessments.